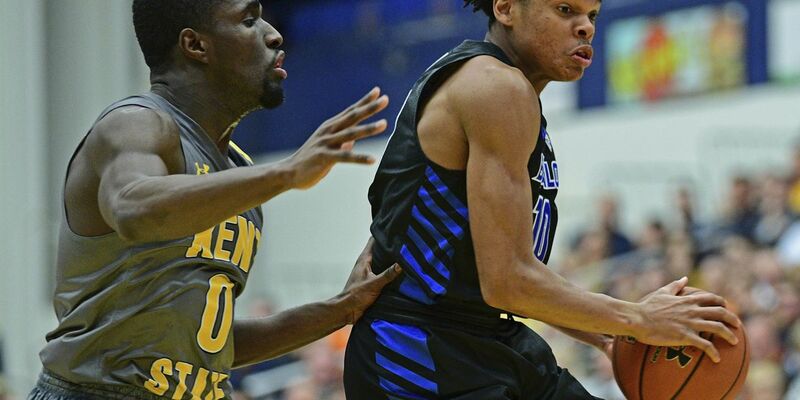 KENT, Ohio (AP) — CJ Massinburg and Nick Perkins scored 20 points apiece as No. 14 Buffalo pulled away in the final minutes and avoided dropping its second Mid-American Conference game in four days with an 88-79 win over Kent State on Friday night. The Bulls (18-2, 6-1 MAC) showed their experience and poise down the stretch to hold off the upset-minded Golden Flashes (15-5, 4-3), who hosted their first ranked opponent since 1989. Clinging to a 78-75 lead, Buffalo, which was beaten at Northern Illinois on Tuesday, forced Kent State into three straight turnovers and converted each time to open some breathing room. Jaylin Walker scored 21 points and Philip Whittington 18 and 13 rebounds to pace the Golden Flashes. Kent State led for most of the night and was up 61-56 midway through the second half when Massinburg, Buffalo's steady senior guard, buried two straight 3-pointers to ignite a 10-0 run by the Bulls. But with the game still in doubt, Buffalo turned to its defense to put the clamps on Walker and the Golden Flashes, who made just two field goals in the final 4:17. Backed by a raucous crowd, Kent State got the start it needed, jumping to a 25-12 lead when Walker, who has a knack for making improbable shots, dropped an off-balance 3-pointer just before the 30-second shot clock expired. Buffalo: Nothing comes easy in the MAC, especially on the road. But the Bulls rebounded from their 77-75 loss at Northern Illinois to stay on first-place Bowling Green's heels in the East.